You’ve almost certainly never heard of today’s Pinstripe Birthday Celebrant unless you’re a resident of Rumford, Maine. This right-handed pitcher is the only Major League ballplayer ever born in that New England hamlet. 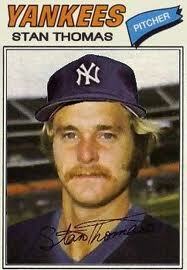 But Stan Thomas was also the winning pitcher of a pretty significant victory in Yankee history. Thomas had played his collegiate baseball at the University of New Haven and was one of the last draft picks ever made by the old Washington Senators team in 1971, just before that franchise relocated to Arlington, Texas and became the Rangers. During the summer of 1974, he was called up to the Rangers, where he pitched for manager Billy Martin for the first time. The following spring, he made the Texas Opening Day roster and became one of Billy’s go-to guys in the bullpen, getting into 46 games, putting together a 3.10 ERA and earning three saves. He also followed orders. During a spring training contest against the Yankees, Martin most likely told his pitchers he wouldn’t be too upset at all if they threw at Yankee outfielder Elliott Maddox. A week earlier, Maddox had called Martin a liar. In 1973, Maddox was a Ranger outfielder when Martin was hired as the team’s manager. According to Maddox, Martin had promised him playing time with Texas but never followed through. Billy’s method of payback for Maddox’s accusation was revealed early on in that 1975 exhibition game, when Ranger starter Jim Bibby hit the outfielder’s shoulder with a pitch in his first at bat. Then in the sixth, it was Thomas’s turn to defend his skipper. He threw a fastball that whistled over Maddox’s head. Naturally, the Yankee pitchers retaliated and an on-field brawl ensued, which was usually a rare occurrence in a big league spring training game, unless Billy Martin happened to be involved. As fate would have it, Martin was fired by Texas before the 1975 season ended and then hired by George Steinbrenner to replace Bill Virdon as Yankee skipper. That move doomed Maddox’s future as a Yankee and probably paved the way to the Bronx for Stan Thomas. The pitcher had been traded by the Rangers to the Indians after the 1975 season for ex-Yankee Johnny Ellis. Thomas had pitched well for the Tribe during the ’76 season, appearing in 37 games, winning 4, saving 6 and amassing a career low 2.30 ERA. That July, in a game against Martin’s Yankees, he also got another opportunity to prove to his former and future skipper that he wasn’t afraid to send messages with his fastball. The Yankees were teeing off on Cleveland pitching and drubbing the Indians when late in the game, Thomas hit both Thurman Munson and Willie Randolph with pitches. As good as Thomas pitched in ’76, Cleveland still chose not to protect him and he was selected by the Mariners in the 1976 AL Expansion Draft. He was having a horrible year for the first-year Mariners, when in August of 1977 he got the word that he had been acquired by the Yankees. He was sent to Syracuse for a while but got called up in September. That 1977 Yankee team had already clinched the Pennant and was going for the club’s 100th victory in its final game of the regular season versus Detroit. Fourteen years had passed since the Bronx Bombers had achieved the century mark, so the game was significant for many Yankee lovers but Billy Martin rightfully couldn’t care less. He was trying to get his team ready for postseason so he rested half his starting line-up and used rookie Ken Clay as his starting pitcher. Still, despite the second tier lineup, the Yankees had just taken the lead and were ahead of the Tigers 3-2, entering the top of the sixth inning, when Martin inserted Thomas into the game. It wasn’t pretty. Thomas surrendered the lead twice but New York battled back to regain it both times. You wonder why Martin kept Thomas in to finish the game because with his late-season 40-man roster in effect, he had plenty of other choices. Perhaps it was his way of thanking Thomas for sending Maddox that message two year’s earlier or perhaps it wasn’t. Whatever the reason, it was Thomas who pitched stayed on to pitch a hitless ninth inning to earn his only Yankee victory and New York’s 100th win of the 1977 baseball season. The then 27-year-old Thomas, would never again get to throw a pitch in a Major League game. Thomas shares his birthday with another former Yankee pitcher and this former Yankee outfielder.